In Alexandria, Egypt, the historian Ammianus Marcellinus described the events of July 21, 365 AD as “slightly after daybreak, and heralded by a thick succession of fiercely shaken thunderbolts, the solidity of the whole earth was made to shake…and the sea was driven away. The waters returning when least expected killed many thousands by drowning. Huge ships…perched on the roofs of houses… and others were hurled nearly two miles from the shore…”. The epicenter of the undersea earthquake was near the plate boundary called the Hellenic Arc, near Crete, and scientists propose it might have actually been two tremors in succession, the larger possibly being a magnitude of 8.0 in modern measurements. Nearly all of the coastal towns in Crete were destroyed by the earthquake as it pushed up parts of the island 25-30 feet in a matter of seconds. The quake sent a tsunami across the Mediterranean Sea, which drained the harbor of Alexandria, leaving many ships grounded. A crowd rushed into the now-dry harbor to loot the ships and were caught completely off-guard when the tsunami wave hit, throwing the ships far inland on top of buildings, killing more than 5,000 and destroying more than 50,000 homes. The surrounding areas fared even worse with some towns and villages completely wiped out. More than 45,000 died and the seawater left so much salt that the farmland was unusable for years. Also devastated were the Nile Valley and the Libyan coastline. No help was to be found from the Roman Empire. Valentinian I only sent an investigator to Alexandria to check on the tax situation. However, with the earthquake of 365 AD affecting Egypt, Libya, Greece, Cyprus, Sicily and Spain, it was easily the most devastating in ancient times. Historians have since speculated that the damage caused by the earthquake and tsunami played a significant role in furthering the decline of the Roman Empire, since all of these areas were under their influence and contributed to their tax base. The tsunami left Alexandria’s coastline permanently changed. The Royal Quarter was eventually swallowed up by the sea. The great Pharos (lighthouse) – one of the seven wonders of the ancient world – was also in Alexandria and eventually was reduced to rubble. The ruins of the old city, along with parts of the ancient lighthouse, weren’t rediscovered until 1995 by archaeological divers. The inhabitants of Alexandria today mark the anniversary each year by saying prayers and illuminating the city at night. RARE ISSUE WITH PHAROS: Egypt. 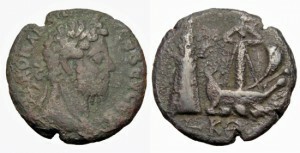 Alexandria under Antoninus Pius (AD 138-161). AE drachm (29mm, 11.10g). 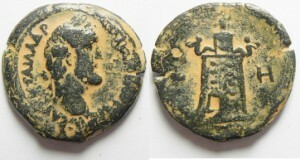 Struck in regnal year 8 (AD 144/5). Valentinian I. AD 364-375. Gold Solidus.